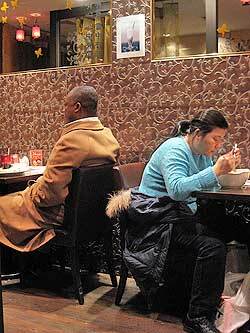 New Yorkers with a hankering for Chinese food expect more than egg drop soup and chicken chow mein. Whether in a fluorescent-lit takeout joint or a white-tablecloth restaurant, Chinese cuisine can be influenced by Latin America, India, Israel, and other unexpected places. Jennifer 8. Lee, author of The Fortune Cookie Chronicles: Adventures in the World of Chinese Food, explains that hyphenated food, such as Chinese-Peruvian or Chinese-Indian, only seems bizarre. 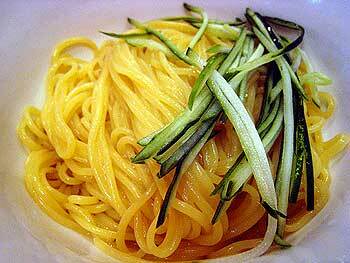 Chinese cuisine is in fact the most pervasive and adaptable food in the world. "You can get Chinese food on all seven continents," Lee said. "In Antarctica, every Monday at McMurdo Station is Chinese food night. In France, it's salt-and-pepper frog legs. In Louisiana, it's Szechuan alligator." 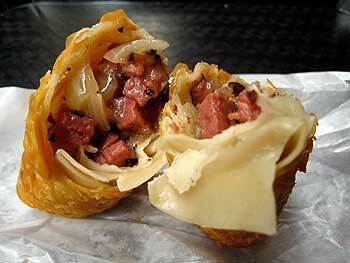 And in New York, it's pastrami egg rolls. Plus Chinese hot dogs, Chinese chicken lollipops, and a Chinese-Korean noodle dish for lonely hearts. These three midtown Manhattan restaurants, within walking distance of one another, offer an unusual taste of New York's Chinese melting pot. Eden Wok is a glatt kosher American-Chinese and sushi restaurant. Six Chinese cooks slice, dice, and sauté in an open kitchen, as Orthodox Rabbi Tzvi Margo watches carefully. A full-time employee of the restaurant, Rabbi Margo, dressed in a T-shirt and apron, is always on call to light burners, inspect vegetables, and make sure the oyster sauce doesn't find its way into the stir-fries. The restrictions of keeping kosher have led to inventions anyone might appreciate. Fusing the tradition of Jewish deli with classic American-Chinese takeout is the Eden Wok Chinese hot dog. 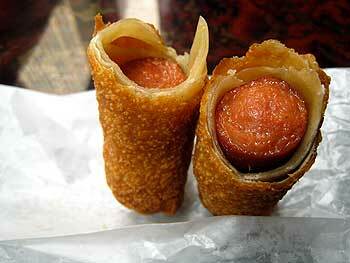 A kosher beef frank is encased in an egg roll wrapper and deep-fried. Greaseless with a golden, blistered skin, it's served with a couple of packets of ketchup and duck sauce for dipping. From the Japanese sushi bar, there's a New York-centric roll made with smoked salmon and cream cheese (non-dairy, of course). Three blocks south is the Indian neighborhood nicknamed Curry Hill. When you start seeing exotic spices, women in saris and Bollywood DVDs on the shelves of the little shops, you're there. (Other people call this area Murray Hill.) The new Indo Munch offers a genuine taste of India—in the form of Szechuan lamb and chop suey. A peek into the kitchen reveals a neat spread of soy sauce, minced ginger, chili oil, and … garam masala. "Chinese immigrants have been living and cooking in India since the 17th or 18th century," explained 29-year-old owner Dinu Mulloli. While Indian-Chinese restaurants have spread like wildfire in India, Mulloli was surprised he didn't see any in New York. 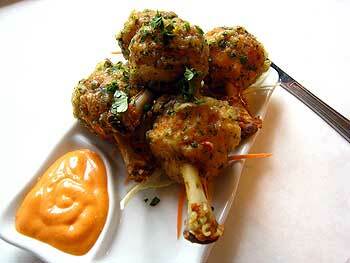 Chicken lollipops are the quintessential Indian-Chinese dish, and the restaurant's bestseller. While the average American-Chinese takeout joint simply throws frozen wings into a deep fryer, Mulloli designates a single cook to trim, marinate, batter, and cook each piece. After three days of prep, the wings are fried to a crisp, piled high on a plate, and served with spiced mayo. Leaving, guests can help themselves to fennel seeds, the Indian equivalent of after-dinner mints. Three blocks west, the neighborhood morphs into Koreatown. This stretch of 32nd Street bustles day and night with visitors to Korean karaoke bars, shops, and 24-hour restaurants. Shanghai Mong is at the center of it all. Between its Chinoiserie décor and cheongsam-clad servers, it's hard to believe this is not a genuine Chinese restaurant. Invented by Chinese immigrants, Korean-Chinese food is a century-old genre unique to South Korean port cities. Melding traditional Chinese techniques with local Korean ingredients, the results bear no resemblance to the food at your local Panda Express. A classic example is a bowl of jajangmyun, thick house-made noodles dressed with a black bean sauce. Known as a Korean comfort dish for lonely hearts, jajangmyun is served every year on Black Day (April 14)—an unofficial holiday for singles. Vanity mirrors are placed above single place settings so those dining alone can keep themselves company during the meal. For a touch of the familiar, the meal still ends with a fortune cookie—which, Jennifer 8. Lee will have you know, is a Japanese invention. Monday-Thursday, and Sunday 11 a.m. – 10 p.m.
Monday-Friday: Noon – 3 p.m., 5:30 –10:30 p.m.
Saturday/Sunday: 12:30 – 3:30 p.m., 5:30 – 11 p.m.